Picadilly styles are modern, cosmopolitan with an international flare, upbeat, and simply ahead of the times. We special order Picadilly clothing directly from the factory for you. We ship from the US. We are very sorry but we can no longer drop ship to customers in Canada. Picadilly Modern Essentials - 3/4 Sleeve Dress 1Y674. 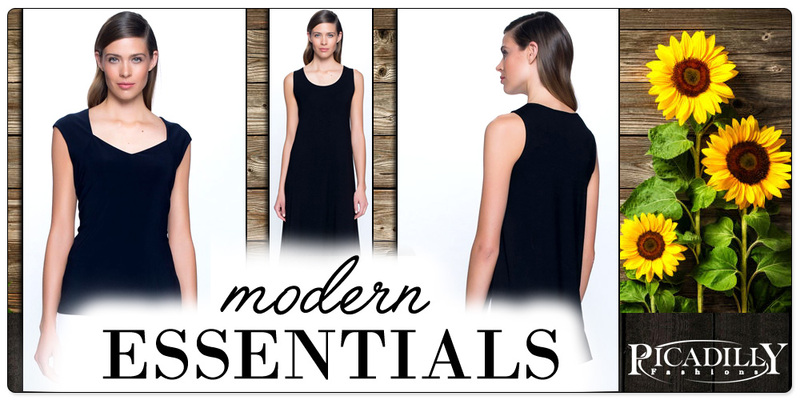 Picadilly Modern Essentials - Front Rouche Panel Dress 1P641. Picadilly Modern Essentials - Jacket w/Chiffon Trim 1G424. Picadilly Modern Essentials - Midi Skirt 1G846. Picadilly Modern Essentials - Open-Front Jacket w/Pockets 1R414. Picadilly Modern Essentials - Pull On Ankle Pant 1M970.